One of the best ways to enjoy the outdoors is under a vinyl shade structure. And while most people are fine with the shade provided by the structure itself, some need some extra sun protection – or some extra privacy. One way to achieve this is with a vinyl shade screen, but which style is right for you? Lattice screens are a popular option for creating shade and privacy. They are the most versatile type of shade screen for vinyl shade structures and allow for many different looks. Lattice screens are especially popular under pergolas and other “open” shade structures because they let a good portion of the sunlight through but still create extra shade and some privacy. Great for airflow since they allow breezes to come through into the shade structure. Provide a fair amount of shade but still let some natural light through. Make a great structure for some climbing plants or vines to create additional shade or visual appeal. 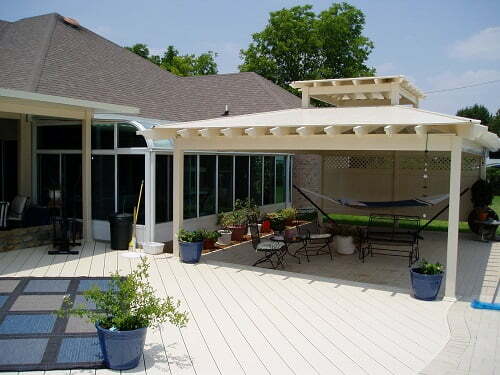 For a balance between shade and openness, louvered panels are an excellent shade option. These slanted panels allow some sun and air through but are more effective privacy options than lattices. Louvered panels are excellent at creating a “beach-y” look and are a great choice for cabanas and other shade structures. Open structure allows air through the panels to avoid stuffiness. Slanted design provides a good amount of privacy and blocks most sun. Better for protecting items from wind or rain than lattice is. Finally, for high levels of privacy and protection, nothing can beat a full vinyl wall on your shade structure. Vinyl walls are extremely durable and completely block all sun, wind, and sightlines into the shade structure. If your shade structure is easily visible from outside your lawn or if the sun is simply too strong underneath it, a vinyl wall can be the best way to achieve extra shade and privacy. Provide the highest level of privacy of any shade screen. Very durable, and require no additional maintenance. Keep belongings and occupants safe from harsh sun. Of course, depending on the effect you want to create you can also use combinations of different panel types. For instance, you can place a full or louvered panel on the side of your shade structure closest to your neighbor’s house, and a lattice on the second wall for some sun protection without blocking airflow. It’s easy to combine different panel types and get the exact shade structure you want. Plus, shade and privacy screens have other advantages beyond making more shade or more privacy. For example, you can use a shade panel to create defined walls for an outdoor room or social area, or even to direct traffic towards or away from different areas. They are perfect for entertaining, and they are also excellent at making your shade structure more comfortable and usable. For more information about vinyl shade screens and shade structures, contact us today at Future Outdoors. We’re the top installer of vinyl fence and vinyl shade structures in the Dallas-Fort Worth area. You can also follow us on Facebook for news and updates or give us a call at (972)576-1600.